That's what happened to me last week. I was in LaGuardia Airport and my flight — surprise, surprise — was delayed. I decided to use that gift of time to check my e-mail and do a little bit of work. But while looking at the Boingo pay-now portal, I noticed that there was slot for a promotional code. HMMM? Minutes later in the gift shop, I saw a stack of "15 minutes Free Wi-Fi" coupons from Boingo. Boingo provides Wi-Fi at over 500 airports, 17,000 hotels (Marriott, Hilton, etc.) and 9,000 McDonald's. Hmm. The clerk gave me a Boingo card and I sat down to log on for free minutes. The promotional code did not work, but I called the tech support number and the Boingo customer rep offered me a complimentary code that would get me online while I was waiting for my flight. 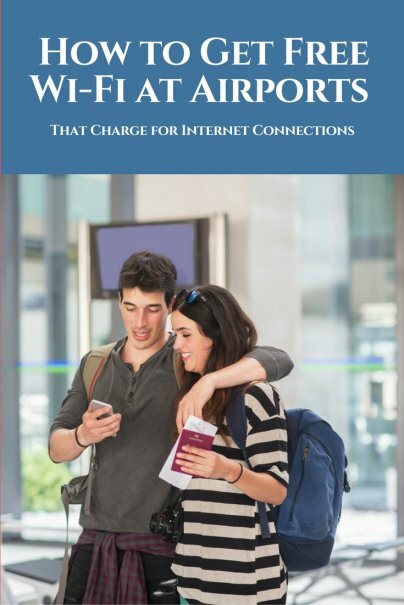 Inquire about free Internet passes at the airport gift shops. If there are no passes, go to the fee-based Wi-Fi portal (website) and look for a toll-free number. Ask the customer rep for a promotional code that will provide you with free minutes. By the way, the customer service number for Boingo is 1-800-880-4117. I'm keeping that number with me when I travel. This was a great tip, I wish I knew this when I used to travel back and forth during my consulting days. I did have some tricks of my own from when I used to do consulting. Most airline reward/membership programs which offer customers lounge access also provide free wifi to the customers from within the lounge area. One of the things I constantly had good luck with was almost all the time my gate was always near one of these president's club or lounge. Sitting near these areas, I was able to pick up the free Wifi signal offered by them. Thanks for this tip, I wouldn't have thought to do this. I think there should be free Wi-Fi everywhere, but since there isn't, this is a good work-around. While I have no problem asking a business for a free trial, to do so repeatedly without ever intending to pay for their service seems dishonest to me. A free trial is a contract: "Try our product, and if you like it, please consider a long-term arrangement." If you're not willing to do the latter, you shouldn't do the former, IMO. This was a great tip. I hate paying for wifi. I can't tell you how many times I've been stuck in an airport refusing to pay for service... especially Hartsfield in Atlanta, but also Texas in a few others. I hope they all have these sorts of promotions! Nice Tip! Very smart - and am with you - Wifi is like water - we shouldn't have to pay for it! Regarding Boingo hotspots; this isn't a free solution but it's handy. If you have the most recent version of Skype for Mac, you can use Skype credits to access Boingo hotspots. It can save you some money; with the Skype credits you pay by the minute, instead of having to buy a block of time from Boingo that you might not use up. Thanks for the tip. This is a definite must to remember the next time in the airport. Great tips - thanks! I tend to spend a fair bit of time in airports, and have a marathon trip next month that will take me 36 hours in all, with a number of layovers in airports. I'll try this out myself, and report back! Wow, awesome tips! I will definitely inquire about free internet passes next time. Great tip and btw, I like your work a lot. I never knew this information. Remember Internet travelers, Airport Hotspots are a breeding ground for malware and shoulder surfers and spoofing sites. We were stuck in Atlanta during what turned out to be a 7 hour "layover" on our way home from Mexico. So I attempted to kill some time by purchasing a Boingo wi-fi day pass. Within 30 minutes I was blocked from their wi-fi for 'excessive' connections, despite me just browsing news websites. I attempted all fixes on my end before calling customer service. I ended up being stuck in the initial queue for like 30 minutes before I gave up and went back to the "old fashioned" airport time killer -- reading. You don't get out much -- do you? Great Tip! The article was very informative! If it is for free I will use it and abuse it! Looking for free wifi in public area is not secure. Be careful when you are connected to public area. Avoid to use free internet connection in public area to do electronic transaction, such bank payment, etc. Thanks for the great tip. I now can finally check my email at airports when I'm waiting. This always happens to me and next time I will be sure to ask around for a promo code. Sharon Harvey Rosenberg has fine tastes and a small budget.